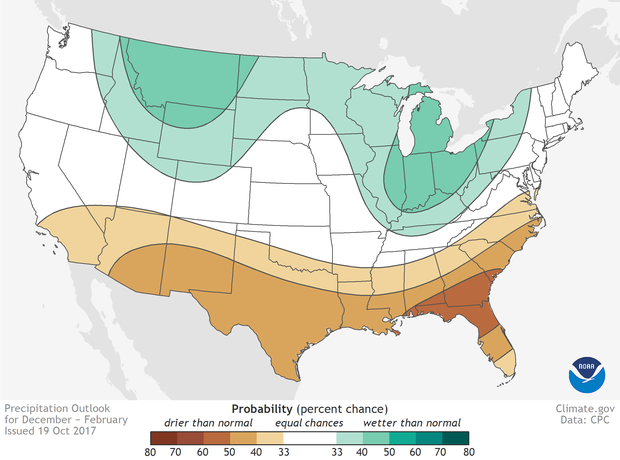 Forecasters Predict Warmer-Than-Average Winter In Majority Of U.S. : The Two-Way The La Niña weather pattern is likely to develop, boosting snowfall in the Great Lakes and northern Rockies and lowering snowfall in the Mid-Atlantic. Forecasters Predict Warmer-Than-Average Winter In Majority Of U.S. 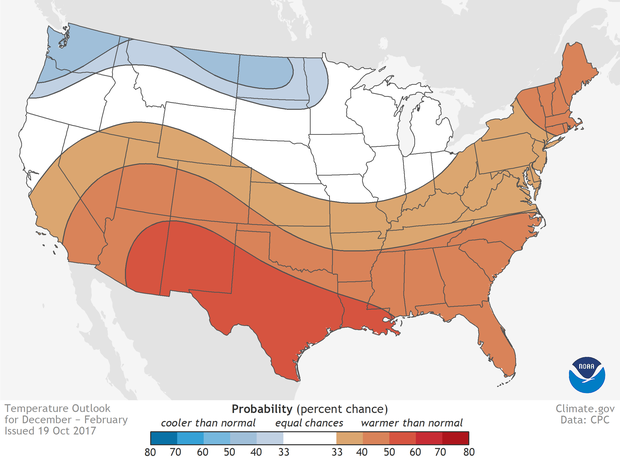 This winter is going to be a warm one for the majority of the United States, according to forecasters at NOAA's Climate Prediction Center. They say that the La Niña weather pattern is likely to develop. That means "greater-than-average snowfall around the Great Lakes and in the northern Rockies, with less-than-average snowfall throughout the Mid-Atlantic region," Mike Halpert of the Climate Prediction Center said in a forecast Thursday. Hawaii, western and northern Alaska and the lower two-thirds of the contiguous U.S. are likely to see warmer-than-average temperatures, Halpert says. A small portion of the Northwest U.S. and parts of Alaska are expected to see cooler-than-usual temperatures. NOAA is predicting warmer-than-average temperatures in December though February for about two-thirds of the contiguous United States. Forecasters are predicting less rainfall than usual across the Southern U.S., Halpert adds, while "wetter-than-average conditions are favored across Hawaii, northern and western Alaska and much of the northern part of the lower 48." This will be the third year in a row that the country will largely face a warmer winter. As The Washington Post notes, last year "ranked as the sixth-warmest winter on record." In fact, trees in most of the Southeast U.S. responded to the warm temperatures and came into bloom early, signaling an early spring. Rising carbon dioxide levels due to climate change are a driving force here, Halpert told reporters, according to the Post. "It does, undoubtedly, play a role. ... The increase in CO2 factors into our model forecast." He added that he does not expect it to be quite as warm as last year. Halpert stressed that these outlooks could change: "For every point on our outlook maps, there exists the possibility that there will be a below-, near-, or above-average outcome."